Pruning salvia indigo or perhaps I should call this post 'How to prune a "broken" Salvia Indigo'? I love this plant, and it breaks my heart to see it broken. I mean who can resist this outstanding plant? It's the perfect combination of large green leaves and stunning deep blue bloom. The salvia indigo spreads itself all over the place, sending its long woody "arms" out to the world and responds tremendously to a good decent pruning, which is after all why we are all here - so let's prune! 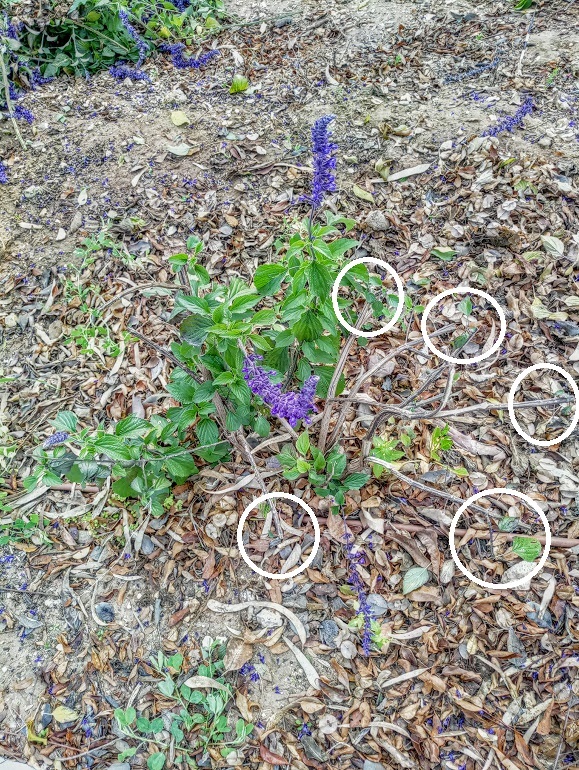 How to prune salvia indigo? When to prune a broken salvia indigo? that depends on how deeply you're planning on pruning. Generally speaking, early spring till early fall is a good time to prune. What I'm about to show you refers mostly to spring, when the weather gets warmer but isn't too hot yet. 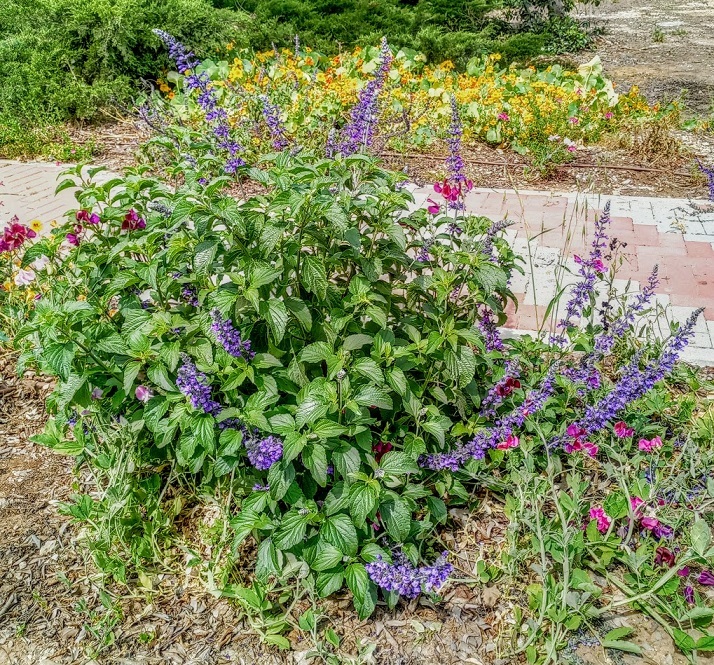 What you see in the picture is the perfect example of what happens when you don't prune your salvia indigo on time. 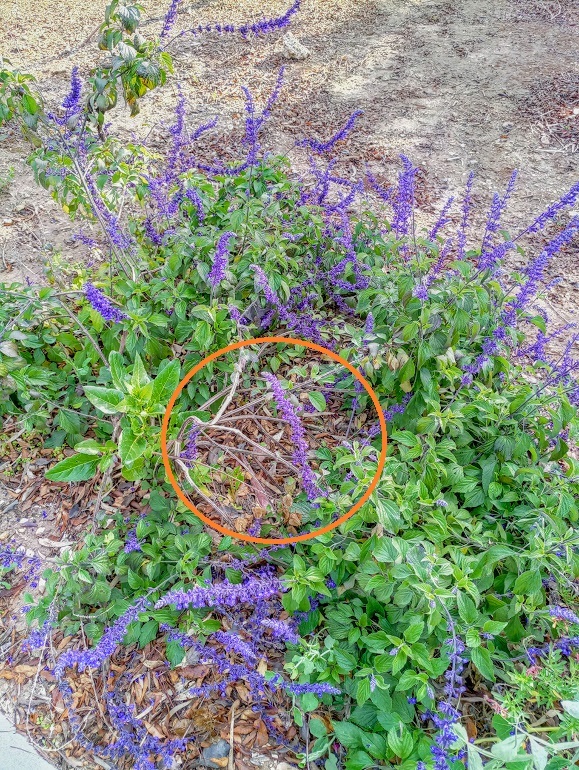 Because of her vigorous growth and her flexible stem structure, the salvia will spread out all over the place, leaving its central base naked and without any leaves on it (see where I have marked it with the orange color circle in the picture). It's a beautiful sight but if you let it continue to grow free it won't have enough energy to spread into its long stems, maintain its stunning colors and may loose its bloom. Not to mention, the stems that may begin to break (look again at the orange circle) - as they did in my case.Which was sad. OK then - where do you start to prune from? Great question! First to be pruned are the broken stems. Always prune beneath the broken stem (of course). Remove it and follow my instructions using the picture below. 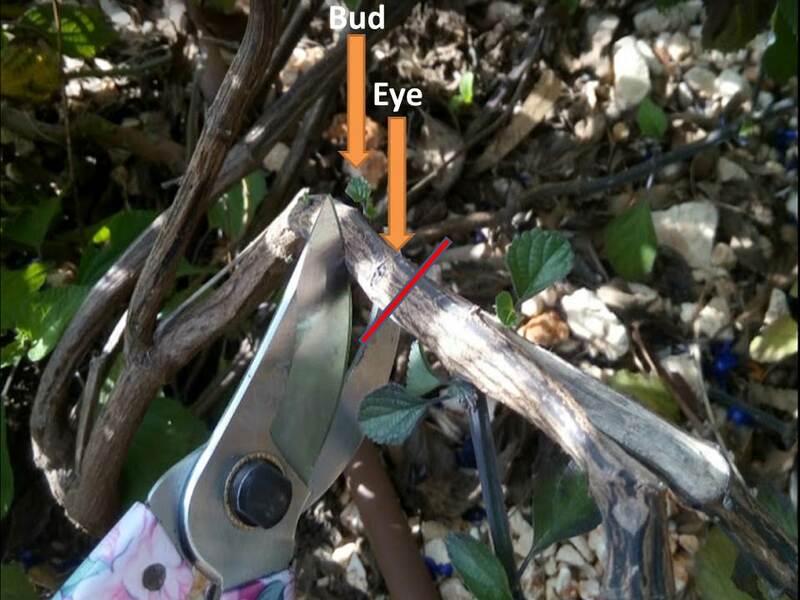 When pruning salvia indigo the exact pruning point should be just above the Eye or Bud (as shown in the picture below). I recommend pruning above the bud if you can spot one that already has leaves on it. Either bud or eye are fine, but pruning close to a bud that already has leaves on it is always better. What's next? Same again for other salvia stems. Please note: remember to leave a few stems with leaf clusters on them for the photosynthesis. You can cut all the plant evenly to achieve a single height, but don't forget to leave those with a few leaves on it. Each of the white circles represent a spot that I have pruned, and each of the spots is close the bud and has a small new leaf that has just been born. That's it folks, you're done. In a few short weeks you'll get incredible new growth which will last the rest of the season. You can decide to prune again at the end of summer because you must let the saliva enter the dormancy stage properly, but if you prefer to just leave her at this stage, that's fine too. Wait until early next spring or late winter, only after dormancy ends and then get your pruning shears out again. For pruning salvia indigo, my preferred pruning shears would be bypass pruners. 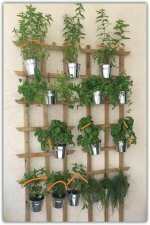 They can handle the woody parts (the low dried stems) as well as the soft upper branches of the plant. Of course you can always use two different kinds of shears, but if you chose to do so, remember that the salvias’s woody stems are actually soft on the inside.